So, you’re getting married in the near future and the time has come to choose your wedding bands. Rather than go for the traditional metals such as gold and silver, you want to try something different, and have decided to go for tungsten wedding bands. Anytime you opt for something away from the norm, there is going to be a degree of uncertainty surrounding it. This is certainly true when it comes to tungsten wedding bands. However, by buying carefully, you can ensure you get great value for money. Avoid mistaking the term ‘value for money’ with cheaper products. If you want to buy a quality tungsten ring, the phrase ‘you get what you pay for’ might be more apt. 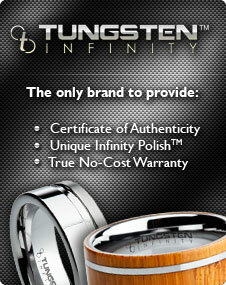 What we’re saying is to avoid cheap tungsten rings at all costs. You can find tungsten rings on Amazon and eBay for around $50 or less, but they will be nothing like the type of quality you should be looking for. Unfortunately, these have given tungsten rings in general a bad reputation. If the cost is higher – we’re talking $199 and above, then you’re in business. However, there’s nothing to say that a company hasn’t just made a sub-standard product and tried to fob you off with the price tag. Look at what materials have been used to make the ring. Tungsten alone can be quite brittle, so you specifically need to look for tungsten carbide wedding bands. These products combine tungsten and carbon at high temperatures to create one of the hardest and most durable substances on Earth, so much so that only diamond is able to scratch it. If the ring is a tungsten carbide, then it is of high quality and the price is likely to be justified. Many companies might advertise their wedding bands as tungsten carbide, but if combined with low prices then it is almost a guarantee that the bands are not what they say they are. You can combine tungsten with almost any metal to create an alloy, but none creates anything anywhere near as strong as tungsten carbide. A correctly and well-made tungsten band is impossible to sell at a low price without making a huge loss, which makes it easy for you to spot the fakes in amongst the real, high quality products. To get real value for money with a tungsten wedding band, ensure you carry out your research in terms of where you’re buying it from, and ensure they have a history of providing high quality tungsten carbide jewelry.